Ordovician faunas of Burgess Shale type. 2010. P. Van Roy, et al. Nature 465: 215-218. 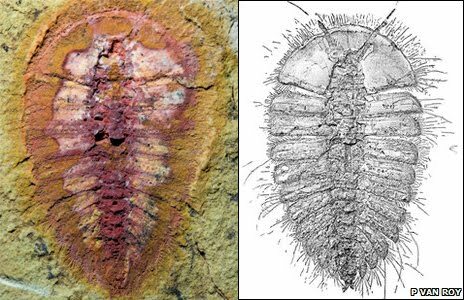 Abstract: The renowned soft-bodied faunas of the Cambrian period, which include the Burgess Shale, disappear from the fossil record in the late Middle Cambrian, after which the Palaeozoic fauna dominates. 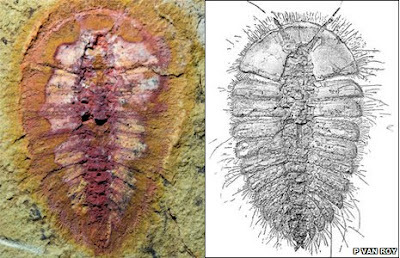 The disappearance of faunas of Burgess Shale type curtails the stratigraphic record of a number of iconic Cambrian taxa. One possible explanation for this loss is a major extinction, but more probably it reflects the absence of preservation of similar soft-bodied faunas in later periods. Here we report the discovery of numerous diverse soft-bodied assemblages in the Lower and Upper Fezouata Formations (Lower Ordovician) of Morocco, which include a range of remarkable stem-group morphologies normally considered characteristic of the Cambrian. The Hero of 50,000,000 B.C. Out of The Woods For 'Ardi'?